1998 ...since Piranesi came to live at the top of the Spanish Steps, he may then have placed the Horti Luciliani purposefully in the same location within the Ichnographia. If this is so, then Piranesi deliberately places himself (figuratively) within the garden of the father of Roman satire. 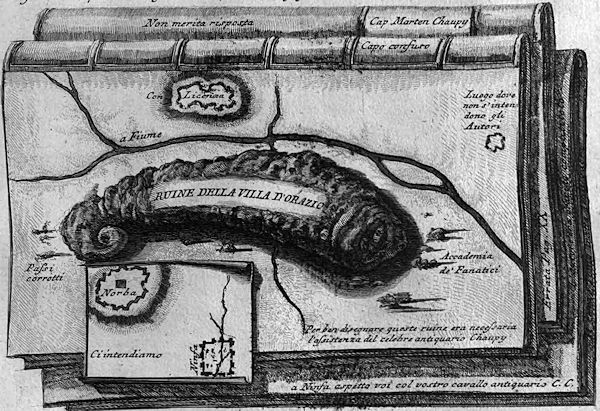 ...find the exact location of Piranesi's home, check its location on the Nolli map, and then find the exact location within the Ichnographia. ...not sure if the exact spot will be significant, but it will be good to know nonetheless. ..find out if Piranesi has in other cases made a direct connection between himself, his work and satire. There is one engraving called Satirical vignette against Bertrand Chaupy something where an island(?) is made to look like a turd. 2000 Diptych: architecture and thinking twice . . . new "buildings" via collage, mesh surfaces, rotation extrusions, design developments. 2002 Yes, signs are a factor of the (shopping center) metamorphosis, but never a complete 'picture' of the metamorphosis. There is much more retro-fitting that goes on inside and out, and yes, even whole buildings come and go (and Las Vegas is a prime example of that). What the shopping sites are more doing is reenacting themselves (and reenactment has never been an explicit Venturi et al design idea/analysis, although reenactment is occasionally a very implicit, and apparently even sub-conscious, Venturi et al design outcome). More true or more false: The more Las Vegas changes, the more it reenacts (the artificial oasis it's been since its beginnings). 2005 [2005.06.11: And don't forget "Creating One's Own Virtual Museum of Architecture" will be presented by Richard Krautheimer and Philip Johnson on 7 July 2005 within the enormous subterranean arched vaults of the Philadelphia Museum of Art (and within a year it was announced that Gehry will be designing new galleries within the same space).] . . . Yes, calendrical coincidence was all the buzz again. As was last weekend's London/Philadelphia bilocation reenactment. And now subterranean arched vaults...from the tube to front row seats. . . . Krautheimer is still just in awe of Tertullian's and Piranesi's "De Spectaculis II" delivered 14 May 2005. It just never occurred to him before that the Mausoleum of Romulus/Circus of Maxentius complex (which reenacts the almost two hundred years earlier Mausoleum of Hadrian/Circus of Hadrian complex) became the paradigm, albeit inverted, for all the Roman Christian "church" architecture immediately after the Basilica Constantiniani (St. John Lateran) and the Basilica San Pietro Vaticano. That aerial shot of the Mausoleum of Constantina (Santa Costanza) adjacent the circus-like dining hall first "basilica" of St. Agnes made it all so clear. If only the circus-like dining hall first "basilica" of Sts. Pietro and Marcellinus adjacent the Mausoleum of Helena were still to be seen from the air. How clever of Eutropia and Helena to invert the pagan 'munus' architecture into Christian 'munus' architecture, and how very clever of Piranesi to secretly hide all this architectural history information within the ever quaestio abstrusa Ichnographia Campus Martius. Krautheimer freely admitted he wants to "redux" his "virtual museum of architecture," the Corpus Basilicum Christianum Romae. . . . Alas, Johnson is still in surprise shock since late January, i.e., he's for the most part speechless, which is a welcome change, even for himself. He never imagined such a thing as the Horace Trumbauer Architecture Fan Club that he is now a part of it, albeit he now has so, so much to really learn. Funny though, he's still "dying" to know what other architects will be joining the club. Whenever he names one of his quondam architecture "friends," the rest of the club just shake their heads "No" and say, "You still shouldn't throw stones." . . . Krautheimer's 108th birthday party yesterday was ever so intellectually stimulating, and Johnson's 99th birthday party tomorrow is being based on the theme of stupefaction. Apparently, Eutropia and Helena still like to invert things, and rumor has it that Maxentius and Constantine might even provide some entertainment with a "song and dance." . . . I wonder if Scott Brown remembers how I told her, at the 14 July 2001 Out of the Ordinary book signing at the Philadelphia Museum of Art, how St. Helena (a native of Drepanum, today's Yalova, Turkey) was the first master architect and planner of Christian architecture. She (Scott Brown) at least said, "That's fascinating." Now I have to tell her how Eutropia, a native Syrian and the mother of Maxentius, was what one could call the brains behind Helena's (and Constantine's) architectural operations. . . . 14 July 2001 was also the first and last time I shook hands with Steven Izenour. He died a month and a week later... I also told Robert Venturi he was the reason I now often visit Stenton. Venturi said, "What!?" So I explained how he, in 1983, via an article in The Philadelphia Inquirer Sunday Magazine, said Stenton was on his list of favorite Philadelphia buildings. Venturi then said, "Oh, you forget things like that." . . . 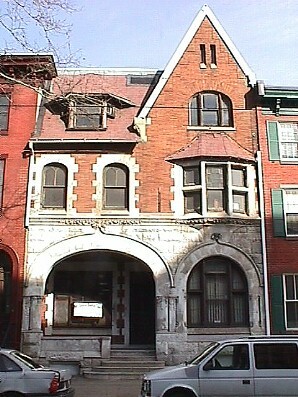 Odd how Venturi, later that afternoon, decided to take the group I was with to a house he recently "discovered" on Girard Avenue, his latest favorite Philadelphia building. 2013 Start filling out the Ichnographia Quondam (pages) via spontaneous association. Imagine that, a large bilocational urban plan composed by way of spontaneous associations.